From the Book Jacket: Whatever we feel - whether happy or sad, excited or wishful, proud or lonely - our faces mirror our emotions. In this contemporary yet timeless collection, sixteen evocative poems are brought to life in diverse and detailed faces that reveal the universal feelings we all share. Girls and boys, women and men invite us to experience their world, understand their lives, and find the connections that bring us together. 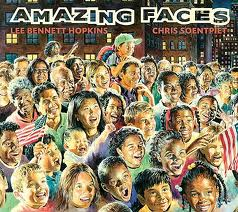 Poet Lee Bennett Hopkins gathers these insightful works from an impressive array of authors. Glowing illustrations by Chris Soentpiet infuse the verses with atmosphere and exquisite settings. Readers of all ages will want to feast their eyes on these captivating poems and pictures again and again. Really powerful, right? Made me question why I'm not using more poetry in bullying or friendship lessons. So I'm on a quest to find more poems around these themes. If you know of any GREAT poetry books that could bring some happiness and healing into a child's life - please share in the comments. I'm really excited about using this poem in a lesson with my students. There is another poem addressing loneliness in the book that struck me called Miss Stone. Really feel like I will be able to get to those deep layers with kids thanks to this new book of poetry on my shelf with such wonderful illustrations. Even my 20 month old daughter could not stop looking at the pictures. My goal is to always use resources that are impactful with children - this is definitely one of those. Awww, thanks for the shout out! I LOVE this book and the man who compiled these does have a few more anthologies out there. I'd also recommend No Perfect People, Please by Diane Asitimbay for your poetry collection!